Transform your home or office with comprehensive bathroom and kitchen remodeling from North Houston Construction & Design in Houston, Texas. From concept to completion, we handle every step of the process for you. At North Houston Construction & Design, we take pride in offering you kitchen and bathroom remodeling that spans everything from small upgrades to total renovations. Whether you want sinks moved to an opposite wall, walls knocked out, or custom cabinets and countertops, we are here to cater to your design. 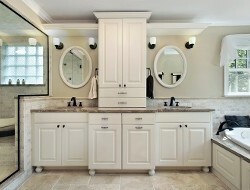 Simply show us a picture of the custom cabinets you would like and we custom build them for you. As total renovation specialists, we are with you every step of the way. That includes going with you to help you pick out sinks, faucets, appliances, and anything else you may need for your project. We are fully dedicated to bringing your dream kitchen or bathroom to life! Contact us to enjoy the bathroom or kitchen of your dreams.